The “rings” were a British-influenced line system. Yellow is the initial deployment of forward screening forces, green the initial line of main forces, blue the first fallback line, and red the final one, where the survivors would switch to a positional defense after a fighting withdraw. In practice, the shambolic 2003 army facing an overwhelming opponent was unable to implement it in any meaningful way. Even in theory, it uses the mobile heavy divisions as part of the ‘anvil’ rather than a separate Stalingrad-style “hammer”. 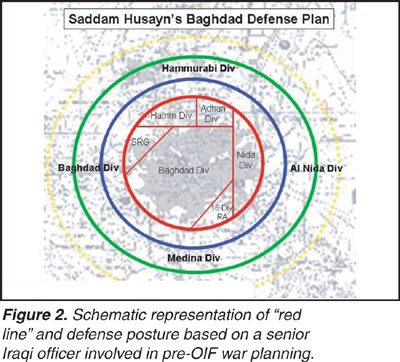 Yet it remains an interesting example of a plan to have a large corps-sized unit defending a very large city. Today marks the anniversary of the 1973 Arab-Israeli War, frequently called the Yom Kippur War. The conflict featured the largest post-World War II armor engagements up to that date and the widespread use of anti-tank and anti-air missiles. Egyptian troops storm the east bank of the Suez Canal in a propaganda painting. One of my favorite looking tanks is the infamous M60A2 “Starship”. The tank itself had a deservedly short and unglorious career. Its 152mm gun-missile system and electronics were, er, less-than-ideal, and after only a few years most were either converted back to conventional 105mm M60s or support vehicles, where they served well. But its unique turret just looks fascinating to me. It’s ugly. But that’s part of the charm.